What are the Best Tips for Computer Asset Tracking? People using networked computers in an office. A computer asset is any piece of hardware or software that has value. 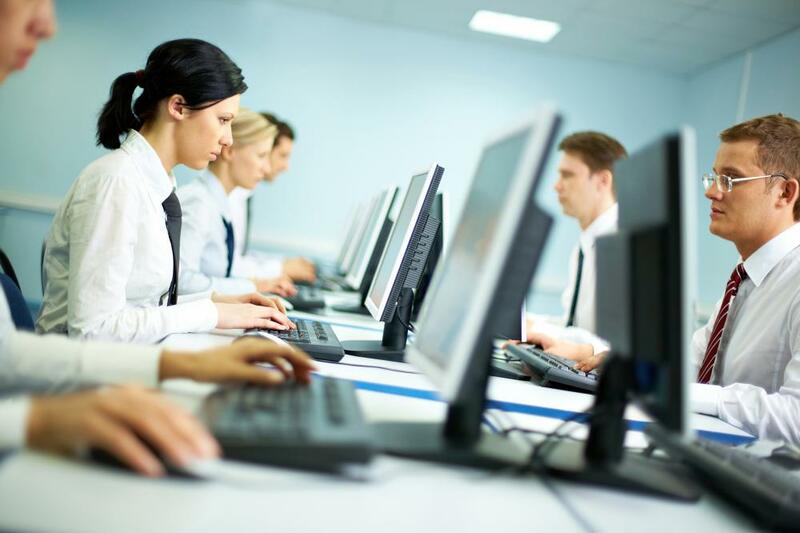 For example, the computers, printers, and servers that are part of an office network and which enable team members to communicate with one another have value because they help to increase productivity. Likewise, a business that leases computers out to clients has computer assets since its computers are used to generate profit. A computer asset tracking system allows inventory managers to keep track of count and location of computers and related components, thereby preventing losses, cutting costs, and possibly increasing profits. Some of the best tips for computer asset tracking are to decide on an inventory control method best for an operation's size and needs and to implement the method in a thoughtful way. To choose the best computer asset tracking method, an inventory professional first should consider the number of computers he or she is responsible for. If excessive time is wasted manually counting pieces of hardware and checking up on software performance, then either a bar code tracking or Radio-Frequency Identification (RFID)tracking method can be used. Bar codes are scanned and information related to the corresponding piece of hardware, such as count and date received, appear on a computer monitor. An RFID tracking system involves use of electronic tags that can be read from further away by a reader that communicates with tags via radio waves. Inventory managers who work with a small number of computers may find that a simpler computer asset tracking system might be more useful and affordable. When only responsible for a few pieces of hardware, a manager can assign each piece an ID number that is manually recorded. Notations can be added to records when pieces of equipment are moved to different locations. Bar code and RFID systems tend to be costly, so managers with lesser computer inventories may find that manual inventory management is more cost effective. Information Technology (IT) and inventory managers of very large corporations, on the other hand, may find that their computer assets are so numerous that they need to outsource asset tracking duties to a third party. In these cases, the cost of software that can handle enormous inventories, as well as the cost of necessary IT labor, can be far more than that of hiring another business. IT specialists in these contexts may spend more time repairing, troubleshooting, and optimizing computer operations instead of concentrating on inventory. Regardless of which computer asset tracking system an inventory manager decides to use, implementation can be an important step. A good tip is to give workers time to plan and prepare before changing to a new system. For implementation of computerized systems, employees may need time to train on programs in order to become comfortable with them. What are the Different Types of Asset Tracking System? What are the Best Tips for Computer Inventory Management? What are the Best Tips for Fixed Asset Tracking? How do I Perform an Asset Inventory?